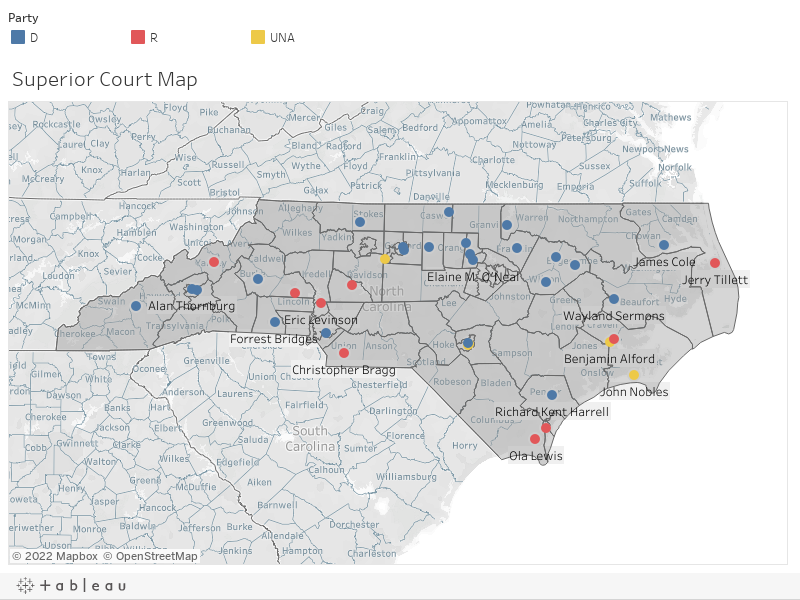 Since new judicial maps were rolled out last June, the General Assembly staff has been asked multiple times by multiple lawmakers to provide information about the impact to current sitting judges. They have yet to fulfill any of those requests, and Rep. Justin Burr (R-Stanly, Montgomery) — the chief sponsor of judicial redistricting legislation — has said in more than one committee meeting that they do not have that information. There have also been some GOP committee members who have claimed that judges’ residency information is protected. In truth, it is not. Policy Watch has analyzed incumbency data in three of the seven maps, including the latest proposal introduced last week, based solely on information available to the public. While it has been time-consuming, it has not been an impossible task by any means. We’ve included a guide below on how we analyzed incumbency data for House Bill 717. This is for both for transparency to show our process and to provide an easy step-by-step guide for legislators to show how they too can analyze the maps. Step 1: Request a list of all current district and superior court judges from the Administrative Office of the Courts (AOC). The list is long — there are 95 superior court judges and 269 district court judges. Step 2: Start an Excel spreadsheet to gather information about each judge in one place. For our analysis we collected each judge’s name, their current judicial district, the latitude and longitude of each of their residential addresses, their party affiliation and their election term expiration. Step 3: Look up each judge on the State Board of Elections and Ethics Enforcement online voter search. This is the most time-intensive portion of this process, but once it’s done, updating information later is a breeze. Some helpful notes: several judges have very common names and some judges go by their middle names professionally but register to vote with their first name or vice versa. This will require some legwork to make sure you’re looking up the right person. In most cases, an Internet search for a judge’s full name suffices, but in some case, it requires more information from the AOC and the Board of Elections. We also gathered party affiliation on this website. Step 4 (optional): To allow for some level of privacy, we did not collect judges’ addresses in the Excel document and instead gathered latitude and longitude to plot them on the maps. This required an extra step on our part: plug addresses into a latitude and longitude finder and collect the information on the Excel sheet. We used latlong.net. Step 5: Request judicial election information from the Board of Elections to determine the year each judge’s term expires. Step 6: SAVE your Excel documents. We created one for district court judges and one for superior court judges. Step 7: For all of our mapping and data visualizations we use a program called Tableau. It is available to download as a free trial, and to buy at a discounted rate for some organizations. Step 8: Import the judge data collected in Excel into Tableau. Step 9: Download the shape files of the proposed redistricted maps from the legislature’s website, and import them into Tableau (or similar software) in order to render the data. This will show the lines of the new districts in the updated proposed maps. Step 10: Plot the locations of the judges in Tableau and label them with Name, Party, and Current District. The Current District label will allow you to see where a particular judge would land in the new map compared to the district they are currently in. Layer this information on top of the shape files of the proposed new districts. If desired, you can also filter information to be based on Term Expiration, which may help in the analysis process later (see bottom of post for those examples). Step 11: Decide what you want to know and analyze the data. We wanted to know about double-bunking, so it required zooming into each district and counting up the number of judges and comparing it to the number of allotted seats for that particular district in the proposed new maps. This will also be time-consuming. Step 12: Once we ascertained which judges were double-bunked — see this report for how that can come to pass — we gathered all of that information into one table. You can use Excel. Step 13: Continue analysis: you can look at so many different things once the maps are all in one place with judges’ information on hand, and you can also request and research more information, like demographics, to take your analysis as far as you need. Note: If you continue this process as new proposals are unveiled, you will have to update your base information — add or subtract judges, update addresses, etc. 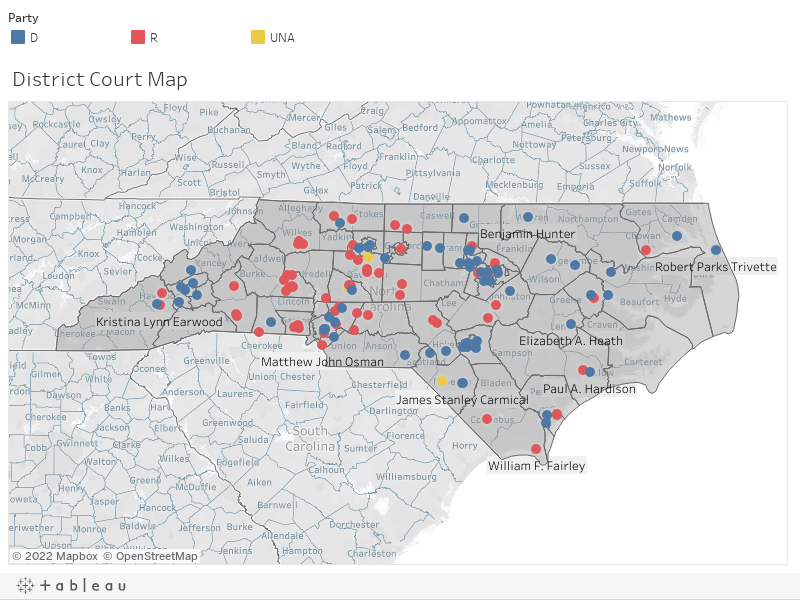 It is possible to make a mistake, but until the mapmaker provides this information, Policy Watch hasn’t found a better way to measure the impact of redistricting judicial districts. Here are two more examples of the maps with incumbency information, this time filtered by term expiration, so it shows who is up for election in 2018.